Its what the racers do off the line in both indoor and outdoor skating. It’s what the ice skaters do around the rink in the Olympics. It’s the first time you learn how to balance on one foot. 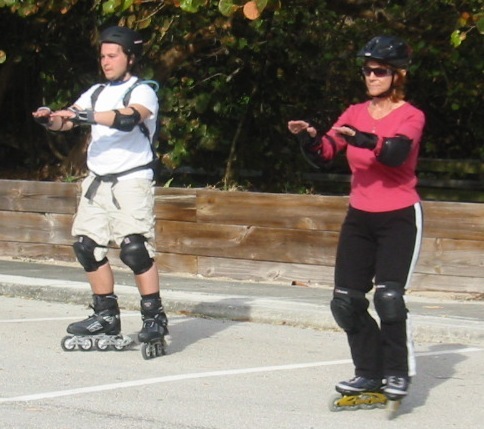 It’s the only way to learn how to do the basic stride I, II and Skaters’ Stride. It is so versatile that when you reverse the pattern from a ‘duck’ pattern to a ‘pizza slice,’ you can learn to skate backwards. It’s the basis for striding: keeping your feet at a 45 degree angle; bringing your feet together after each push. Do it right and you are on your way to becoming a speed skater. You see it is the essence of all further moves: keeping your feet together, power push from the heel wheels, knees moving throughout the move, balancing on one leg than the other, proper form of head up, shoulders back, ‘intentional arms’ and abs engaged. It has it all until you get to rotation that is. But you can’t learn to turn until you can learn to walk. For teachers it’s easy to move on, too quickly. Don’t. If the student can’t duck walk they can’t stop and they can’t turn. Keep them duck walking but make it fun, stepping over stuff, following the pattern you have chalked on the ground, allowing them to quack or change it to a penguin walk and have them sing something from Happy Feet. Whether it’s for you or the student learn to duck walk slow and deliberate, then pick up the pace with elegance, knees bending constantly throughout the movement until you can do it perfectly. Learn to walk before you run. Everything comes down to the duck walk. I’ll tell even more about it later. For now, consider the possibilities.